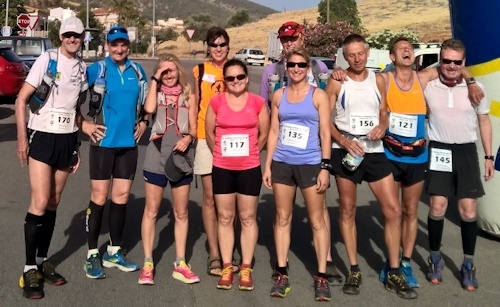 So what on earth possessed a group of Ripon Runners used to the cold, wet, muddy condition of North Yorkshire to have a go at running a multi-day race during the hottest part of the summer in Southern Spain? Well Ray Raper, Nick Wilson, William Foreman and Paul Morgan had done the event in 2010, which was neither as far nor as hot (so they said). They had returned triumphant and euphoric, having won the second team prize. Six years later, Ray persuaded a group of us to go to Andalusia to take on the challenge. Why not have a run in the sun away from the miserable British weather? The tracks are good, the scenery is stunning, it’s a friendly low-key event and very reasonably priced compared to Marathon des Sables. So Iain, Paul, Ray, Bill, Chris, Michael, Mel, Claire J, Claire B and Sheena signed up enthusiastically and I offered to crew, keen not to miss out on a week in the sun. Sadly Claire B had to pull out at the last minute due to injury. 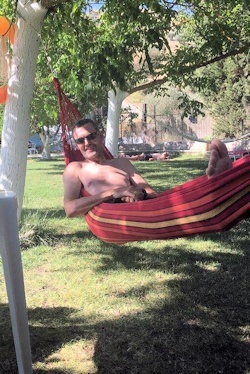 The Race started and finished at the Hotel Manzanil in Loja, a traditional working Spanish town one hour north of Malaga. There we mingled with the other competitors from all corners of Europe and beyond, all top calibre ultra-runners, well-trained in this sort of thing, looking on bemused as we hydrated ourselves on the local beer. We soon gained recognition as the Ripon team and they got used to us! Actually they were a fantastic bunch, serious about their running, yes, but so friendly and full of good humour too! Day 1 and 72 enthusiastic runners headed off to run 39 km (1,330 m elevation) over the mountains to Alhama de Granada. As they climbed, so did the temperature and by the end of the day there was no mistaking what was to come as this was one of the “easier” days! After a very hot night in tents in a Sports Hall or on top of our sleeping bags outside the hall, fuelled on rehydrated breakfast concoctions, they were off again. 48 km today with 1,640 m elevation. By the time the runners had reached the checkpoint where I was helping, the heat was taking its toll. Iain was no longer able to take on food and fluid so had to stop and 10 others failed to complete the stage. That night a group of weary runners with aches, pains and blisters, found a lovely local restaurant for food, then donned head-torches to walk back to the “rustic” campsite consisting of rough tents on stony ground by a stream. We hunkered down to the sounds of snoring and a barking dog. Day 3 was 39 km and since Iain was still too poorly to run, we swapped roles and I ran. It was a beautiful route through a resin plantation and up mountain tracks with stunning vistas. The checkpoints were such a welcome sight, a chance to rehydrate and be wrapped in iced towels to bring down the body temperature. Once again, the campsite left much to be desired; toilets, where all used paper is placed in an open bin and showers consisting of a hosepipe attached to a cold tap at one end and a few shower heads held up by meshing at the other. All modesty and vanity has long gone by this point and we’re all looking as rough as the campsite ground, except Mel who looked as fresh and cheery as ever. That night a local chef cooked up a splendid paella for us all and brought in crates of beer. A welcome change from reconstituted camping food and recovery drinks. Day 4 was the killer – 67 km with 2,031 m elevation. I was on checkpoints 2 and 5. By the time they got to checkpoint 5 at 47 km, the runners were digging deep. They had had huge hills to contend with in the heat and now had a large tarmac section with no shade to take them to the finish. Two of our group failed to complete this stage along with others. The one consolation was that despite an even worse campsite, (overflowing toilets, more barking dogs!) we had the use of a hotel pool and facilities and an evening meal at the hotel. Day 5. 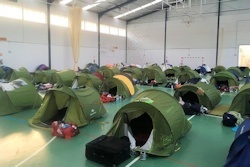 Sleep deprived, blistered, patched up with tape, bandages and compede, lathered with more sunscreen and bedsore cream, everyone knows it’s just 38 km back to Loja and 2 star luxury – a bed, a shower, clean clothes, proper food and air conditioning in the rooms where it functioned properly. I joined Iain on this last stage back over the mountains. I don’t think we ever really got used to the heat but all the runners were euphoric as they crossed that finish line, having got there through grit, pain and determination. The sense of achievement from doing something as hard as that stays with you and you gain an understanding of what drives the ultra-runner. We have made friends with some amazing and inspirational people. Ripon Runners should be proud of their Al Andalus team and especially by the outstanding performance of Claire Jamieson who was 2nd lady overall, and Bill Foreman who was 7th. Only 50 competitors out of the original 72 completed the full race within the time limits but what was so wonderful about the organisation was that you could still run stages even if you hadn’t completed a particular day.